It may very well be one of the more extraordinary scorecards seen in local cricket. But it doesn’t even seem to be out of the ordinary for Buckley Ridges’ superstar captain-coach David White – who in the space of weeks – has played two of the most memorable knocks in DDCA history. It was only a few weeks ago on Wednesday when the former South African A player belted 150 not out in a Twenty20 against HSD off just 59 balls, sending 16 sixes over the rope in the process. But, on Saturday on the opening day of Round 12 in DDCA Turf 1, White played a knock that was same same but different, rescuing his side from deep trouble against a high quality Hallam Kalora Park group pushing hard for a top two spot. Coming in at 1/5, White battled hard early to see off the new ball, reaching 30 off his first 51 balls, but crucially, was quickly running out of partners as the Bucks slumped to an astonishing 9/66, with gun quick Jordan Hammond in absolute fine touch with four wickets next to his name. The Hawks bowled with discipline, fielded superbly, and made smart tactical decisions in suffocating the life out of a Buckley batting group – albeit without Daniel Watson who is suspended – who love to play with freedom and flair. But that’s where things changed – White launched a stunning counterattack, combining for a 115-run stand with number 11 Wes Nicholas (five not out) to give the Bucks something meaningful to defend. In the space of just over an hour, White went from the 30 to a remarkable 147 off 99 balls, belting 15 sixes and seven fours in a display of hitting not seen at this level. In those two remarkable knocks, White has blasted 297 runs, 31 sixes from 149 balls at a strike rate of 199.32. Let that sink in. Eventually White holed out as the Bucks made 181, with the next highest scorer being Susa Pradeep with eight. His numbers also make for impressive reading, with 831 runs (including Twenty20s) at an average of 166.2 from 10 innings in the DDCA, highlighting just how much of a class above he is. But the Hawks had the last laugh at stumps and are in a strong position to claim a massive win, reaching 1/79 off 44 overs at stumps to set themselves a great platform to spring an upset, with Ben Hillard (26 not out) digging in for the visitors, while Leigh Booth batted well to make 38 off 72 balls. Berwick and Mordialloc, meanwhile, are engaged in a tight battle in what is a vitally important match in the context of the finals race down at Arch Brown Reserve. Just six points separates the two sides in fourth and fifth, and it seemed early the home side would be in for a big day at the office with the bat after reaching 62 for the first wicket. 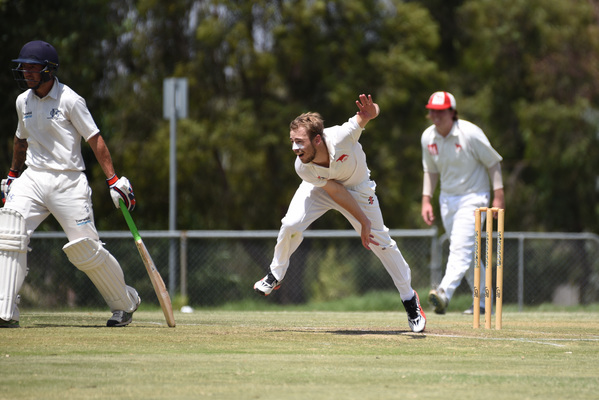 Nathan Pilon (68) continued his brilliant campaign with yet another entertaining half-century, but his wicket – bringing the score to 2/106 – brought about a collapse, with Bloodhounds champion Ian Daniel (6/34) finding his groove to rattle through the middle order. The Bears were unable to handle Daniel’s subtle seam movement and nip, with the home side bowled out for just 154, a disappointing result considering their blistering start. The Bloodhounds seemed to be handling a tricky 36 over stint with the bat before stumps ok, but Jack Phillips (3/18) sparked a top order collapse, with the visitors finishing the day on 5/104. Gun opener Brendan Morris looms as the key after fighting it out to finish on 60 not out off 114 balls, and will need to be removed early for the Bears to have a chance of claiming the crucial points. Ruwantha Kellepotha also continued on with his utterly stunning Turf 1 season, peeling off a century against Springvale South at Alex Nelson Reserve. The St Mary’s star blasted 116 after his side won the toss and elected to bat, and in the process, compiled a strong total of 235 in 74 overs against the powerhouse Bloods group. Spinners Craig Slocombe (6/52) and Malinga Bandara (4/75) were simply sublime with the ball, combining for 46 overs between them to be the main catalyst in keeping the total under 300. 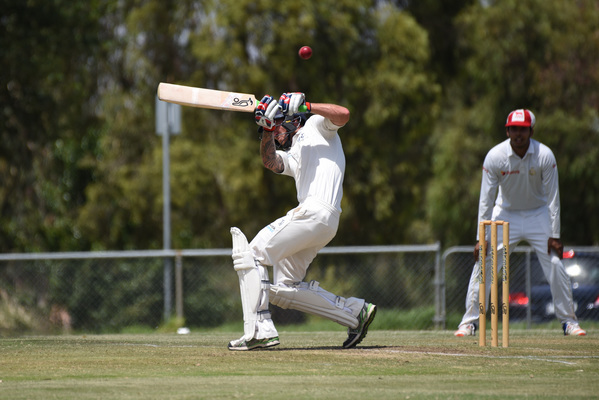 And Heinz Southern Districts posted a competitive 6/212 against North Dandenong at Reedy Reserve, with Michael Davies returning to his very best with an unbeaten century. Slick Davies came in with his side in a bit of trouble at 3/40 after star all-rounder Kaushalya Weeraratne was dismissed early, but played with his usual class and aggression to spank 10 fours and a couple of sixes. Davies finished on 100 not out, with the Cobras managing to bat the day out despite the best efforts of Muharjithan Thedchanamoorthy (4/40) and Austin Heldt (2/22). The Maroons will face an uphill battle to chase down the runs, but need to do so to keep pressure off the relegation battle with St Mary’s and the Cobras.